2045 Brookwood Medical Center Dr.
Is your child facing some complex dental work? Is your child routinely anxious when seeing the Birmingham children’s dentist? The staff at Angelica Rohner Pediatric Dentistry gently assists young patients in getting the dental treatments they need so everyone relaxes and oral health thrives. Dental phobia is a very common condition, and not only do kids suffer from it, adults do, too. Claustrophobia, social anxiety, sensitive teeth, difficulty sitting still because of physical limitations–they’re all valid reasons why young and older patients feel anxiety in the dental chair. Yet, preventive and restorative services are critical to oral health and overall well-being. What happens as teeth form and erupt sets the stage for great smiles later on in life. Dr. Rohner offers 2 fully monitored sedation options: nitrous oxide gas and hospital sedation with general anesthesia. Nitrous oxide, or laughing gas, helps kids get through cleanings, fillings and other simpler procedures. Hospital sedation at the One Day Surgery Center at Children’s Hospital facilitates complicated procedures such as extractions and dental crowns. Nitrous oxide is a very relaxing medication. Administered via nasal mask about 5 minutes before procedures start, laughing gas takes effect quickly and wears off fast, too. Many times, it’s all a youngster needs to get all his or her work done. Hospital sedation involves closer monitoring of vital signs and level of consciousness. Patients usually drop off to sleep and awaken to some side effects such as grogginess and minor nausea. Two adults must accompany a sedated child so one can drive and the other can ride with the young patient on the way home. After any sedation dentistry, kids should not return to school until the next day, must eat a soft diet for a day or 2 and take over the counter pain medication as needed. Dr. Rohner encourages parents to call the office in Birmingham with any questions or concerns after kids have received sedation. 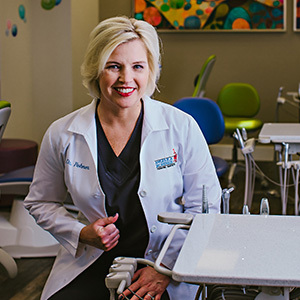 It’s as simple as sedation dentistry from Angelica Rohner Pediatric Dentistry in Birmingham. No child should get stressed out about dental care. When patients need a bit of help, Dr. Rohner and her caring team deliver precise dental treatments with medication to calm the nerves. Contact the office with your questions about sedation dentistry. Full Name Email Address Phone Number Comments/Suggestions? Finding new ways to provide excellent pediatric dental care is our priority. Contact us today to schedule your child's appointment! We look forward to keeping your child’s smile bright and cavity free.